It may harken back to days gone by, but forest company Conifex finds that moving logs by water is still a very efficient way to move timber, despite having to deal with the weather on Williston Lake in the B.C. Interior, which at 164,600 hectares is the largest man-made reservoir in North America. Four log harvesting contractors working in a remote and rugged region where black bears and ravens far outnumber people. Winding down a 70-person camp for closure while responding to pressure to move wood volumes before winter’s onset down an unpredictable ‘highway’ that’s perpetually wet. All of the above is situation normal for Conifex Inc.’s logging operations around Williston Lake in northern British Columbia. Towing up to 25,000 cubic metres of bundled short wood from Conifex’s Mesilinka camp to the company’s Mackenzie sawmills takes about four days. The journey can be longer, despite smaller tows, when the weather’s unco-operative, which is increasingly normal as the season progresses toward freeze-up. The journey to the mill can be easily lengthened by a couple of days for logs harvested around the far northern end of Williston Lake, which at about 164,600 hectares in size is the largest man-made reservoir in North America. Mark Pride is forestry operations coordinator for Conifex Mackenzie Forest Products Inc. He’s worked ‘up the lake’ for about 20 years accumulating first-hand local knowledge that’s an invaluable asset toward keeping log harvesting operations progressing efficiently and on schedule, despite the logistical challenges. About 90 per cent of Conifex’s 932,500 cubic metre AAC is located up around Williston Lake, north of Mackenzie, B.C. Towing up to 25,000 cubic metres of bundled short wood from Conifex’s Mesilinka camp to the company’s Mackenzie sawmills takes about four days. Logging in relatively isolated areas places a premium on both self reliance and cooperation, says Pride. It comes with the territory, like the wildlife. Maintaining scrupulously clean camps, for example, is a must. 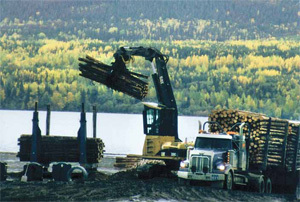 During the 2011 harvesting season, most of the logging took place within an average 25 kilometres of the Mesilinka camp and log dumping operations on the Omineca Arm of Williston Lake. That was unusual. Hauls typically average 80 kilometres and can stretch to 130 kilometres. Conifex’s crews are chasing the mountain pine beetle infestation, like all other logging contractors and companies throughout the B.C. Interior. Fortunately, the bulk of the main road infrastructure is in place, notes Pride. The lodgepole pine component of the Mesilinka area forests is 35 to 40 per cent, he says. But other factors require consideration. Suitable summer and winter season harvesting sites must be prepared. About 90 per cent of Conifex’s 932,500 cubic metre AAC is located up around Williston Lake, north of Mackenzie, continues Pride. The four regionally based log harvesting contractors (a fifth is scheduled in 2012) hold variably sized contracts. Duz Cho Logging and the KDL Group are the biggest operations with about 350,000 cubic metres each. Ingenika Logging and King Bros Logging both harvest between 80,000 and 100,000 cubic metres annually. The end of season push was to get all the remaining felled wood processed and out of the bush. “We have 14 processors between all four contractors and most of them are double shifted. That’s about 22 processing shifts mainly handling the smaller, dryer wood,” explains Pride. All the harvested wood has to be trucked to the Mesilinka log dump site making it one busy place. Incoming logging trucks cross the Conifex-run scale, each with a payload of about 74 cubic metres. “Sixteen feet is the preferred length for our wood, with 14s and 12s comprising 10 to 15 per cent and we have three main sorts,” says Pride. An average 55 loads a day come across the scale. As each logging truck manoevers into position, the dump contractor uses a Cat 325 to unload it, placing the logs in a tipping bunk system with a capacity of about 37 to 38 cubic metres. 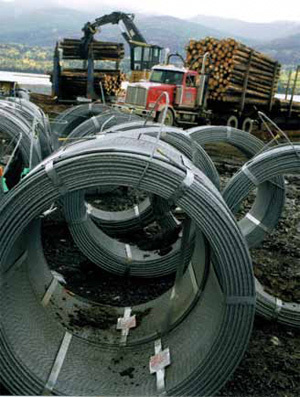 The load is then bound by cables to contain it and the bundle is dumped by gravity into the lake’s contained catchment area. The bundles await the attention of Conifex’s boom boats used to help build the tow. As each logging truck manoevers into position, the dump contractor uses a Cat 325 to unload it, placing the logs in a tipping bunk system with a capacity of about 37 to 38 cubic metres. The load is then bound by cables to contain it and the bundle is dumped by gravity into the lake’s contained catchment area. This is the third edition of the tipping bunk system. It has a portable base so it can be moved around easier to adjust to changing lake levels. Williston is a reservoir with the primary purpose of hydro power production. Seasonal fluctuations in lake levels can reach 50 feet, he says. The switch to short wood has also helped. 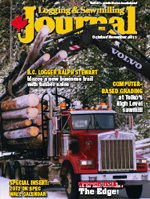 “It’s easier to handle the bundles—you can tow more wood than tree length and it’s significantly cheaper,” says Pride. Conifex’s navy also includes two barges. When pinned together and hauled by tug they can move about 10 pieces of logging equipment up or down the lake. Pride says if the barges are mainly empty they can make it back up the lake from Mackenzie to Mesilinka in about 12 hours. It can take double that time if pulling up sticks, the term applied to the load forming logs. The returning barges also routinely carry supplies like the chains, ropes and fuel for the smaller boats. “The barges have been an extremely useful tool,” summarizes Pride. And when not earning their keep for Conifex, the barges can be contracted out to other lake users like BC Hydro crews and mining exploration companies. Using water to move logs has a long and colourful history in Canadian lore. The pioneers of the practice would doubtless be fascinated and impressed by Conifex’s industrial scale water borne operation. The underlying premise, however, remains unchanged. Water can be a highly efficient medium with which to transport logs from one location to another.